IT'S 15 years since Frank Schillig visited New Zealand but the things he remembered best, the great scenery and friendly people, haven't changed. 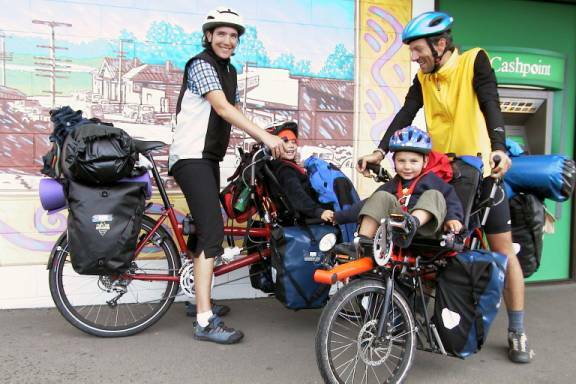 It's just as well because it was those memories which encouraged Frank to bring his wife Aja and their two children Lara, 5, and Jona, 4, from Germany for a five month cycling tour of NZ. ``We decided to make the trip now because next year Lara will be in school and we won't be able to take long holidays,'' Frank said when the family stopped in Katikati. They arrived in town after two weeks cycling from Auckland, over much of the Coromandel and into the Bay of Plenty on two tandem bikes specially designed in Germany. The children ride on seats in front of the handlebars and have their own sets of wheels. ``They don't really pedal very much though,'' said Aja. The family averaged between 50 and 60km a day, staying in youth hostels, motor camps or tenting on the roadside. They enjoyed the Coromandel but found the 309 Road from one coast to the other more than a little challenging. ``In Europe the roads tend to wind fairly gently up hills, here they seem to go straight up and down the other side,'' said Frank. Frank is keeping a record of their travels, and intends to write articles when they return to Germany. From Katikati the family headed to Tauranga, then down the east coast, with plans to cross to the South Island and continue their adventure there.